THE Scottish Secretary has challenged Nicola Sturgeon to explain how the SNP intends to use the extra powers it wants beyond those already coming to Scotland under the pre-referendum vow. David Mundell has indicated that the UK government will not meet the SNP’s drive for more powers unless Sturgeon’s party produces “detailed proposals” to demonstrate the benefits of further devolution. The challenge was issued ahead of this week’s Queen’s Speech, which will put the Scottish constitutional question at the forefront of the political agenda once more. Attempting to harden the UK government’s negotiating stance, Mundell claimed the SNP’s demands were “short on detail”. 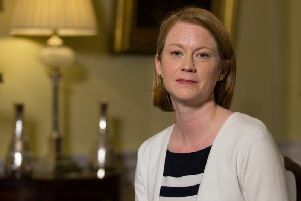 The first Conservative Scottish Secretary in nearly two decades also accused the SNP of using its demands for more powers as a “smoke-screen to hide the fact” that they do not use Holyrood’s existing ones. David Cameron’s programme for government will contain a new Scotland Bill to bring forward the proposals contained in the Smith Commission set up to deliver the pro-Union parties’ vow for more power made during the referendum campaign. The Smith proposals include giving Holyrood the power to set income tax rates and bands as well as control over a share of VAT and some welfare benefits. As soon as the Smith Commission was signed off by all Scotland’s main political parties, including the SNP, Sturgeon began arguing that it should go further. The Prime Minister has said he is prepared to consider the SNP’s demands, which will be made as the Scotland Bill is debated in the House of Commons over the coming weeks. In an interview with Scotland on Sunday, Mundell said he was committed to delivering the Smith Commission, adding that the Scotland Bill would become law by February next year. But on the question of powers beyond Smith, the Scottish Secretary said he was open to the SNP’s suggestions, but added: “Really, they have got to tell me what they actually want. They can’t just make vague demands if they want us to consider their proposals. The SNP and Scottish Government needs to come up with detailed proposals and show how these powers would actually work. Mundell’s remarks angered the Scottish Government. A spokesman for Deputy First Minister John Swinney said that as the sole Tory MP in Scotland for a Government “with no mandate” north of the Border, Mundell was “in absolutely no position to lecture or challenge the Scottish Government on more powers”. The spokesman added that the Scottish Government would be “happy” to provide the detail of its proposals. The Queen’s Speech on Wednesday will see the SNP raise fears that the draft Scotland Bill legislation has watered down the Smith recommendations. The Scottish Government and Holyrood’s Devolution Committee have expressed concerns that the legislation would not allow the Scottish Government to create new benefits, would give UK ministers a veto over welfare changes and could create confusion over who paid income tax in Scotland. The launch of Cameron’s legislative programme will also see the reinforced SNP Westminster group attempt to flex its muscles by attempting to overturn the Conservative government’s plans to ditch the Human Rights Act and introduce a British Bill of Rights. Having won 56 of Scotland’s 59 seats and established itself as the UK’s third-largest party, the SNP believes with the help of Labour and Tory rebels the 12-strong Conservative majority can be overturned on the ­issue. The SNP has been a vocal opponent of the Conservative plans and believes that it can achieve its objective with the help of the so-called Runnymede Tories. Named after the English meadow where the Magna Carta was signed, Runnymede Tories such as David Davis, Ken Clarke and Dominic Grieve have indicated they are opposed to the proposal to cut the formal link between British courts and the European Court of Human Rights. Sturgeon said that SNP MSPs at Holyrood would also work to disrupt Cameron’s plans. North of the Border, the Human Rights Act is enshrined in the 1998 Scotland Act, which created the devolved Scottish Parliament. The SNP argues that abandoning the Human Rights Act would require the consent of Holyrood. Last night, a Downing Street spokesman said: “The first thing to say is that human rights are not being scrapped, because a British Bill of Human Rights will be introduced rather than a European one.